We are successfully producing quality, flair, design and innovation for the UK and International Markets, to the UK and European leading brands. We operate from our state of the art design and sampling factory in Leicestershire with partners in Romania & Turkey. We use the very latest Stoll CMS Machinery which are capable of Knitting all types of structures and patterns to generate the perfect finished product. Our machines are set to use 3, 5, 7, 10 and 12 gauge yarn with other gauges sourced as required to knit styles to our customer’s specification. All types of Knitting techniques are available, we specialise in Intarsia, Shaping and Fashioning. 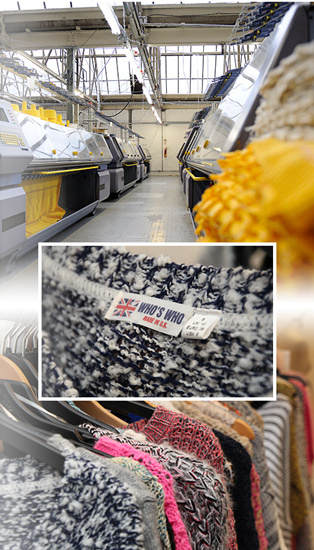 Who’s Who Ltd offers 4 to 8 weeks lead times whilst repeat orders are often faster.